The Trixie Fabric-Lined Cat Condo (pictured here) is a heckuva lot of fun just waiting for a lucky, pampered, and most of all loved cat to enjoy. Any good cat parent knows that keeping a cat entertained and engaged is good for her physically, mentally, and emotionally. Providing your cat with novel, new, and exciting opportunities keeps her on her toes… and adorable toes, at that. I love everything about this cat condo – its great looks, reasonable price, and the many opportunities for a cat to explore and enjoy. She can even hide out inside and plan her sneak attack. We all know how much cats love the sneak attack. I also love that it’s compact and close to the ground, meaning that even the clumsiest cat will be perfectly safe from harm. One of my cats, Alexa, fits this description perfectly. Even she couldn’t cause a disaster with this cat furniture. When it comes to keeping things fun and exciting for indoor cats, we like to rotate cat toys, scratching posts, and even cat furniture. It makes each of their treasured possessions last longer but, more importantly, it keeps things fresh and new for them – something outside cats are awarded with, by God, on a daily basis. We have to provide the fun and variety for inside babies. The Topi Cat Condo will provide endless opportunities for your cats to play, scratch, explore or just relax. This stylish piece of cat furniture combines the best of both worlds: a condo hideaway and a scratching surface. Felines can sharpen their claws on the large scratching surface wrapped in durable sisal instead of on your furniture or carpet. If a nap or a place to hide is in order, the cat can crawl inside the kitty condo which is covered in plush fabric both inside and out, making it the perfect retreat. Feeling a little spunky? Taunt the plush toys suspended inside, sure to peak your little hunter’s interest. Suitable for cats of all ages and activity levels. One year warranty. Color: chocolate brown. Dimensions (inches): 18 x 12 x 13; condo opening 6 x 6. Weight: 3 pounds. This Cat Furniture with Scratching Surface is available on Amazon – click through for a closer look and more information. A few years ago I found a way to BOTH make Christmas last all year long AND be able to actually afford to get the things for my family (with fur and without) without breaking the bank over a span of two months: I buy things throughout the year and hide them safely away. 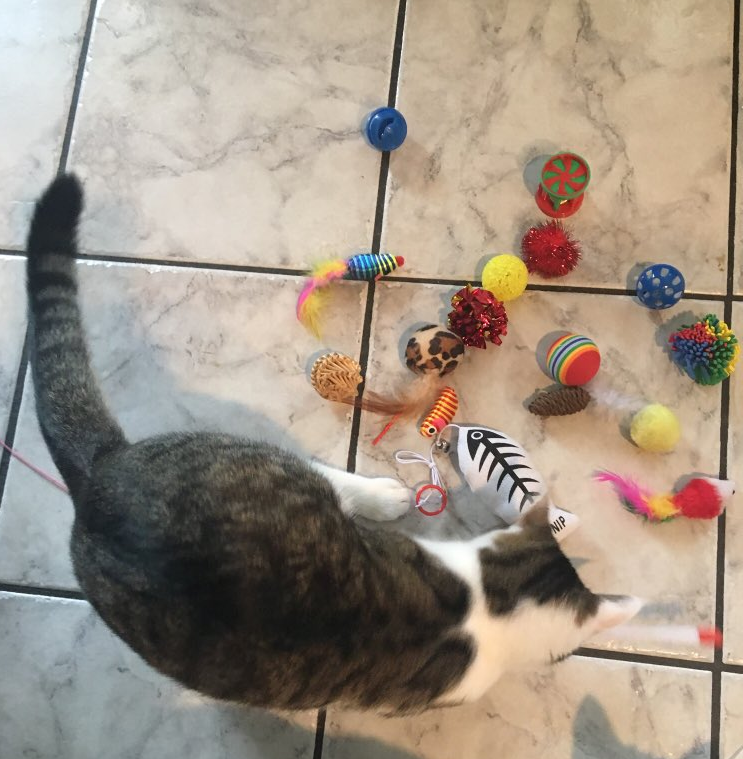 Most of my shopping is done on Amazon – which is where I bought this great Cat Toys Variety Pack from. I intended to save it for Christmas morning and open it for our cats… but… well… as you can see, things don’t always go as planned. When UPS brought the Amazon box, the cats came running. They know that an UPS delivery always, always, always means they get a new box to play with. When they gathered around, I couldn’t help but think what a fun afternoon it’d be if I gave them this gift early. As you can see, the thought of it was more than I could fight off and we had a little Christmas in May party right then and there! Their excitement and joy was palpable and reminded me of kids… the ones that walk on two feet (generally) and aren’t covered with hair… on Christmas morning. 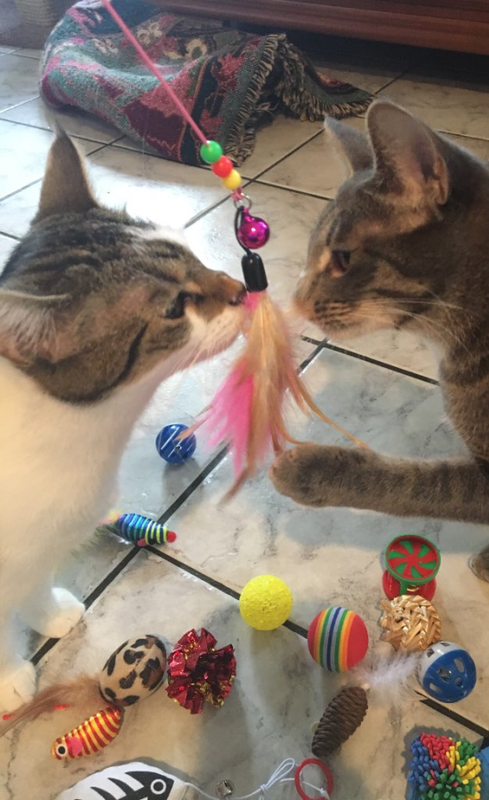 Furry kids get just as excited – going in circles, not knowing which toy to play with first. 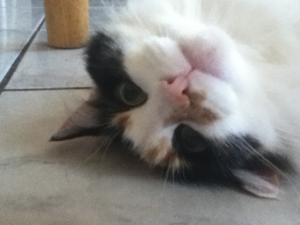 If you have cats, you know exactly what I mean when I say that I’m not sure who enjoyed themselves more – them or me. This is a wonderful Cat Toys Variety Pack – it was even better than I’d expected it to be. For such a great price (between $12 – $13), I wasn’t sure what kind of quality to expect from each individual toy. I was surprised and delighted to see that the quality was excellent. Each toy is very, very well made and is standing up to intense play perfectly! 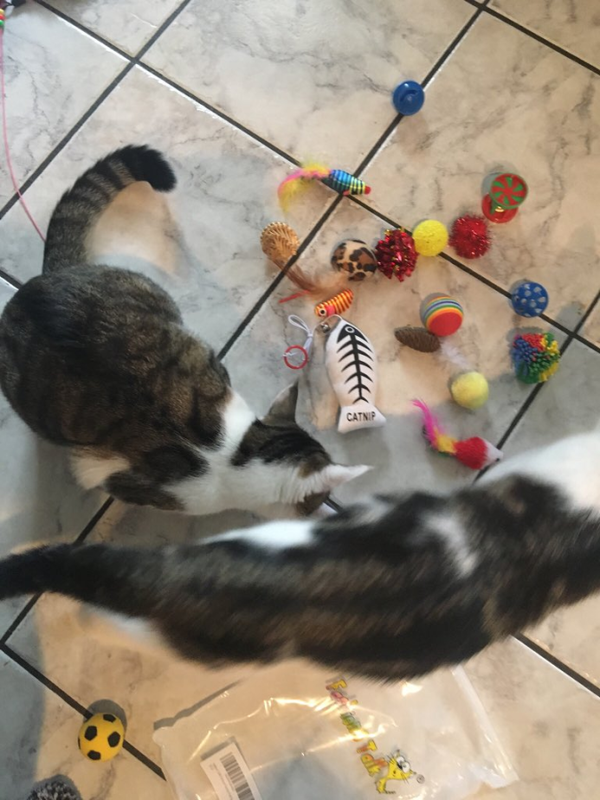 I tried to take several pictures to show off the variety of toys – as well as our babies enjoying them… but it’s very difficult to photograph excited, fast-moving cats! The picture at the bottom is of Nacho and was taken a few hours after the toys had arrived and had been played with fiercely. Each cat was worn out (just like human kids!) and had found their own favorite place to recuperate and conserve energy. Nacho was in his favorite bed, resting up from all the activity – I pranced one of the toys in front of him and he sat right up. Sure enough, he hopped back up and decided it was playtime again. The girls (one at a time) all joined in and we had another round. In the weeks since, the toys are played with again and again. I like to gather them all together and present them like I did that day – the excitement is the same each time. Again… I am not sure who enjoys it all the most, but I think she might just be typing these words. Two of our cats recently had kittens – you can surely imagine the crazy fun we’ve had the past few months! All of our cats love to play, but kittens treat playing like oxygen – if they’re awake, they’re looking for something to get into. We bought them a collapsible cat tunnel and I’m not sure I’ve ever seen a bigger hit. Kittens and grown cats, alike, are losing their minds over this tunnel! They carry toys into the tunnel, run through it top-speed, hide out inside the tunnel (their hide and seek games are especially epic), and even fall asleep inside – right in the middle of playing. I’ve gotten a kick out of watching the kittens play with it, but I think I’ve gotten even more joy from watching the older cats “become kittens again” by playing with it. Tunnels like this stimulate a cat’s creativity and heighten their shenanigans. Trust me, it’s really something to behold. Playtime isn’t just fun for your cat (and you), it’s wonderful exercise AND keeps his/her mind active and keeps them from becoming bored. A bored cat is a miserable cat – toys are the best way to keep that from happening. Tunnels have an advantage on a lot of cat toys – they can be enjoyed (and will be enjoyed) by the cat even when its humans aren’t home. See: Eyourlife’s 3-Way Cat Tunnel for more information! The colorful Tower of Tracks Cat Toy, pictured here, is a huge hit with cats. They’re fascinated with the balls as they move along through their path. Three levels of fun gives inquisitive cats three times the fun! With three tiers, it’s the perfect toy for multiple cats, but one curious cat can have a party all by itself! I love the sturdy construction and non skid pads at the bottom – this means this cat toy can, literally, stand up to whatever our cats throw at it. Click through the following link Tower of Tracks Cat Toy for a closer look. There are videos, pictures, and more information. One of the top reviews called this the best cat game ever. High praise! Let’s talk about cats for a minute. Like toddlers, they LOVE to be entertained and, again like toddlers, they LOVE their toys. They’re all about newness and enjoy nothing more than new toys or possessions to check out or new experiences to actively pursue. That’s why I’m always on the look out for fresh, fun, exciting new cat toys, cat beds, and cat furniture. The Ripple Rug (pictured above) answers to all of these! When I look at this, I think of it as a “cat enrichment center” as much as anything. There are endless possibilities for your cat to enjoy herself/himself. See Ripple Rug for more information as well as more great pictures. The Natural Pet Company Cat Toys Gift Box includes 7 great looking toys that’ll mesmerize your cat(s). The toys, themselves, are beautiful, but I’m especially impressed with the gorgeous box they come in (and can be stored in). The fact that this set of toys come in their own storage case? Purr-fect! While this would make a great gift idea for the most important recipient in the equation… the cat!… it would also make a very thoughtful and MUCH enjoyed gift idea for any cat lover. Mother’s Day, Father’s Day, Christmas, Birthdays (the human’s or the cat’s) – there’s no wrong time to give this beautiful gift set. 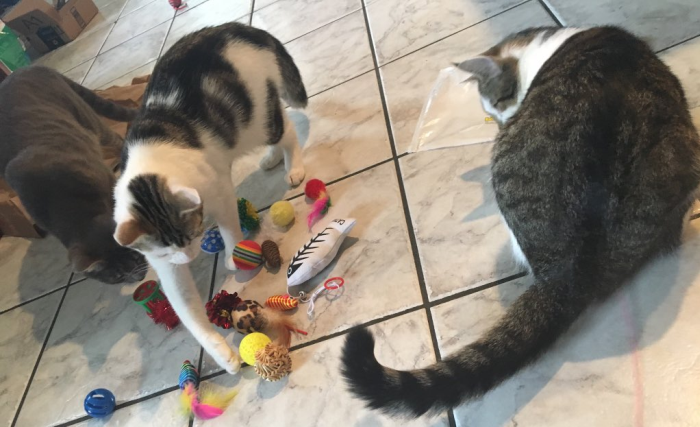 EDIT: Since writing the article below on tips for keeping your inside cat entertained, we’ve added several additional cats (a brother and sisters) for Alexa. Turns out, IF the cat is open to the idea, having other cats around is one of the funnest things for a cat. Endless, built-in entertainment! Keeping indoor cats active (mentally and physically) is one of the healthiest (and most loving) things we can do for them. Outdoor cats have an ever-changing environment. While the outdoors is a more dangerous place for an animal to live, it can be infinitely more interesting and stimulating. After all, one never knows what you’re going to see outside, whereas the indoors (while safe and climate controlled) can be monotonous for the single most curious animal in the world! Luckily, this can be easily taken care of by providing your curious little one(s) with plenty of originality and change – which always fascinates a cat. With my inside cats, over the years, I have always had a system in place where I frequently “trade out” toys. I’ll put a few toys away for a few weeks, while old favorites are brought back out. I often buy my inside cat (Alexa) a new toy. She knows that when I come home with several bags in tow, one of them holds something for her. She scrutinizes each bag like a two-year old! I place her toys in different spots throughout the house. 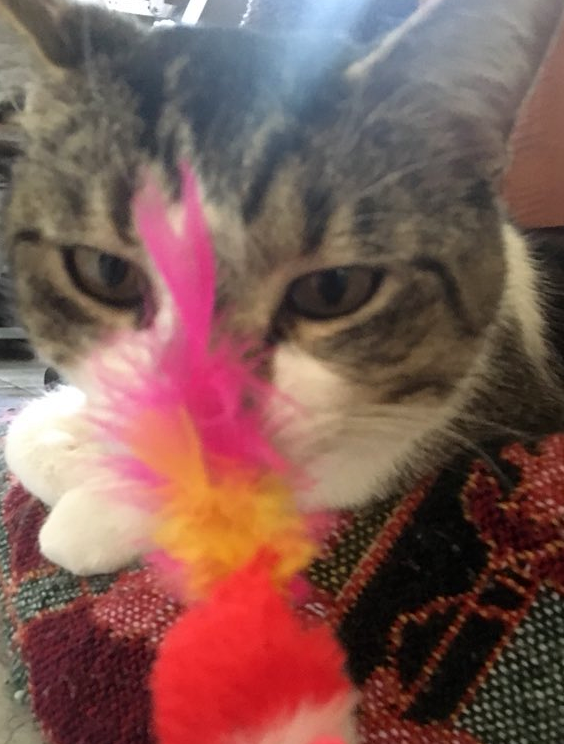 I leave her VERY favorite cat toys where she leaves them, after all I don’t want to stress her out or get myself in trouble – but I’ll frequently place a ball, toy mouse, or other toy in spots to catch her off guard. Many cat parents believe their cats have “outgrown” playing when, truth be told, they’re simply bored with the status quo. Mix things up! Boredom for a cat is as dangerous and uncomfortable as stress is for a human. 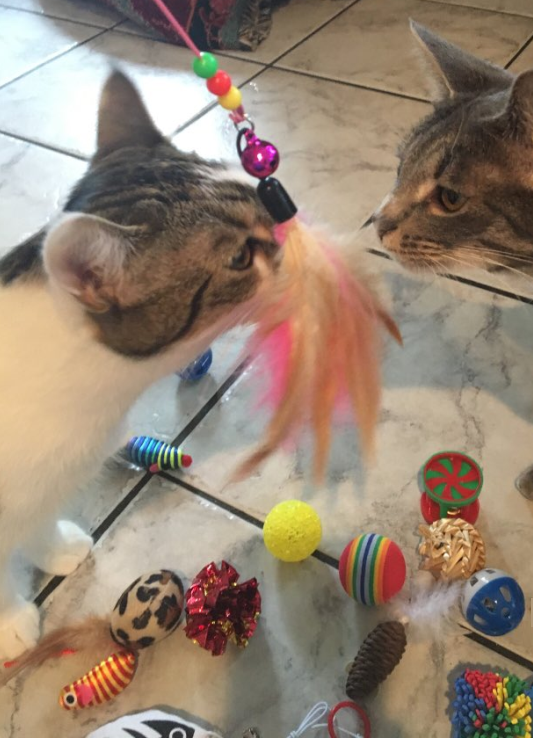 A little experimenting will help you discover what your cat’s favorite types of toys are. 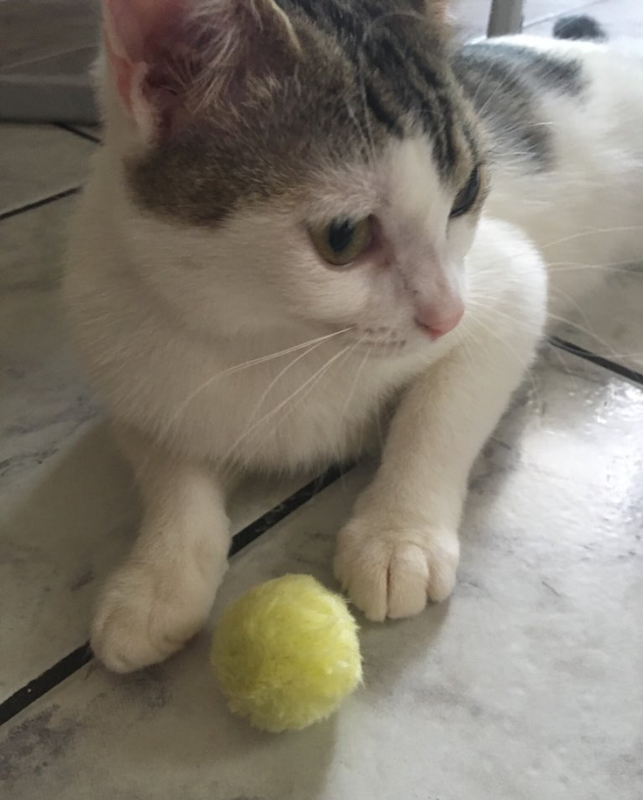 Some prefer toy mice while others barely glance at a toy mouse but will go gaga over a ball. Catnip toys are almost always a hit – however, the catnip does kind of wear off, which means you have to replace the toy after a while. ALWAYS be certain that the toys are safe. Frequently inspect them for anything and everything that could pose a danger to your cat… loose parts, for example that could potentially choke them. Get down on the floor with them and play with them. I’ll let you in on a secret… it’s as good for you as it is for them! This may fall under the category of “crazy cat lady,” but I’ve never let that stop me before: When you’re reading, sorting coupons, writing, etc.. either lift your cat so she/he can supervise you or get down on their level. What’s mundane to us can be utterly fascinating to a cat. Alexa is mesmerized by writing. She’ll concede to watch for a while, then inevitably will reach the point where she can’t take the temptation any longer… then…. whoosh!… she starts swatting wildly at the pen. Cat Tunnels are fascinating for cats! They love running in and out and can sometimes even be found napping inside the tunnel. A great (sturdy) cat tree is something I consider a MUST for inside cats. They have so much fun climbing, scratching, and sleeping on their own cat tree. When we got one, we literally wondered what had taken so long. It’s a wonderful, wonderful gift for your cat. This morning, Alexa played with a new toy for about 15 minutes – right before falling asleep right on top of it. 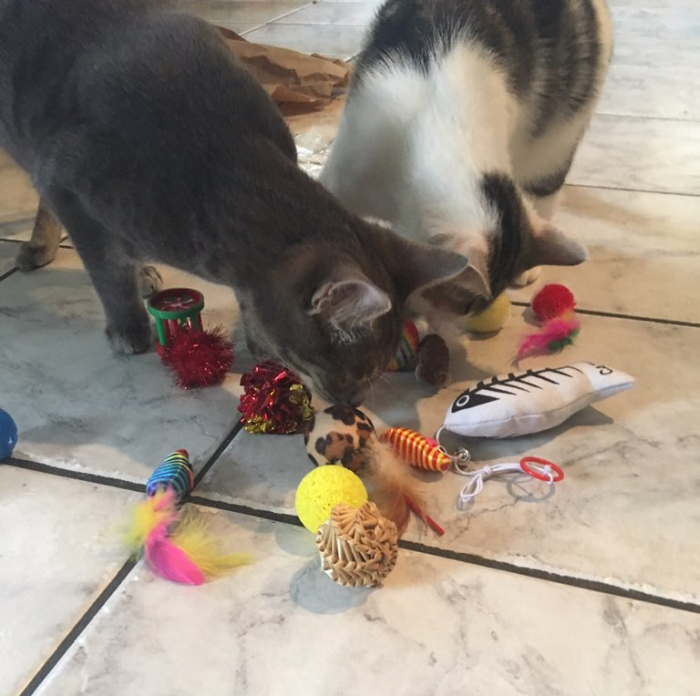 It was a perfect reminder of how much furry kids love new toys – easily as much as non-furry kids! Her joy with this particular toy led me straight to Amazon to shop for her a new toy. She gets SUCH a kick out of seeing a new box come in (whether it’s from UPS or the post office) and an even bigger kick when the box is for her. I found the KONG Squirrel Catnip Toy pictured above and it’ll be in her furry little hands within a week. 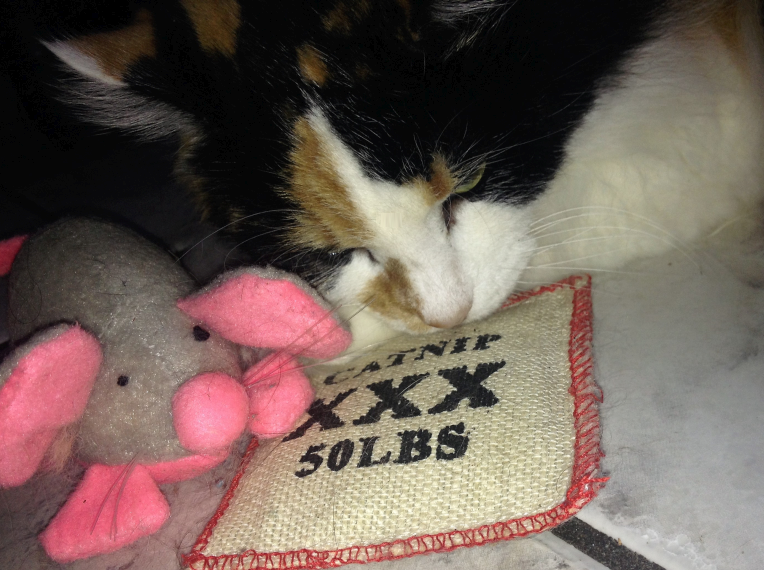 The fact that it’s a catnip toy will make her even more excited. Comes with two pouches, additional pouches are sold separately. The pouches can be frozen to keep the fresh. Toy is machine washable with catnip pouch removed. Click here for more information about this adorable cat toy.